To the lay person in the private sector, this might seem like a nice thing. The boss showing appreciation for his workers by giving them a chance to enjoy the new traveling beer garden at a discount rate. But think about it for a moment. Abele has cut every worker's pay* by more than 10% and up to more than 20% in the three years he's been in office. Now he wants his employees to spend whatever free cash they have - if any - to support his rolling bar. 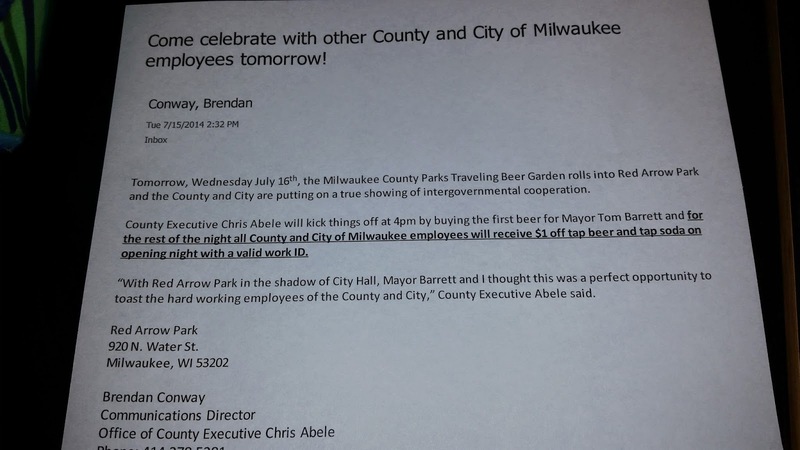 The email sparked a considerable amount of cynicism, ranging from questioning whether Abele would have people there to photograph workers with their county IDs drinking beer to make it look like they were drinking on the job (remember, this is the guy who tried to frame a former supervisor) to whether they would start implementing "random" urine testing starting with third shift workers. This stunt does raise a larger and more serious concern. Not only does Abele’s “merit system” have the smack of being cronyism, but it is also illegal. It violates a number of county ordinances, from the civil service codes to aspects of the labor contract which Abele had just signed into law. It also flies in the face of Milwaukee County’s Code of Ethics, which explicitly forbids any county official or employee from giving or receiving anything of worth. What makes this especially egregious is that the fact that Abele tried to start a cynical campaign to have this law struck down, using the untimely and tragic death of Sheriff Deputy Sergio Aleman, whose widow is also a county employee as an excuse. Abele’s office was telling people that they would be in violation of the ethics code if they contributed to Deputy Aleman’s memorial fund unless the law was tweaked to allow this sort of thing. This is why public sector workers don't get things like Christmas bonuses or other perks that the private sector enjoys. It is to prevent cronyism and nepotism which is running rampant since Act 10. Without a rigid set of rules and a ratified contract, the doors are wide open to the corruption we are seeing in both Walker's and Abele's administrations. To be honest, my first reaction was to warn people away from this event. People like Abele and his supporters will fabricate things to attack their opponents (just ask Marina Dimitrijevic, David Bowen and Johnny Thomas). There is no sense in giving them anything they could use. But after some thought, I would suggest that people go to this event. The workers at the behavioral health complex, at least the ones that aren't being forced into mandatory overtime, should go down there and talk to Abele about the mistake he is making. The retirees, who Abele has been avoiding, should go down there to talk to him about how he is robbing them blind and threatening their very homes with his greed. 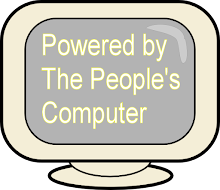 All county workers should go down there to talk to Abele about how he is trying to illegally take away things that are proprietary and thus protected. City of Milwaukee workers should most definitely go down there and talk to Mayor Tom Barrett about how the city wants to follow Abele's cloven footsteps and significantly cut in their paychecks to pay for his whims. By all means, I encourage all public sector workers to go down to Red Arrow Park and share their views on these austerity measures. Just make sure you pay full price for your beverages. *That does not include the staff in his office, to whom he's given raises at a scale similar to what Scott Walker gave to his political appointees, like Cindy Archer. Chapter 9 explicitly prohibits workers from giving or receiving anything of value? No wonder you keep writing worthless blogs. Anon at 8:42, what dark motives that don't make any sense? Please, list as many as you can. Physicians, attorneys, engineers, tenured professors, anyone who uses credentialing to put a floor underneath their wages is bargaining collectively. Other than winning at "sperm-roulette," limiting the supply of your labor is the only legal way to protect wages. 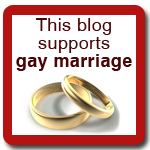 If you know of some other way, please, by all means share it. When you start paying attention, you'll notice the oligarchs want to control everything. Do a search on the bi-partisan Trans Pacific Partnership. Mr. Abele's County Exec because his billionaire Dad was born before he was. Mr. Abele never finished college and prior to getting elected to County Exec, had no record of accomplishments. He could have used his Dad's wealth as a spring board to attracting family supporting jobs to Milwaukee County. He could have led on something as obvious as legalizing marijuana. He could have led on environmental issues (bringing back the thousands of commercial fishing jobs that used to be in Lake Michigan), making Milwaukee County a center of green manufacturing supply chains. Maybe his political advisers can help him figure out that the real "job creators," are consumers with money to spend. Even Republicans used to understand that "economic mobility," matters. They called it "broadening the tax base." They're both at 8:42. And anyone with that much to say,. likely has no one to say it to. Buy a cat .